Workers of an electronics subcon at the Cavite EPZA in Rosario, Cavite went on strike today, paralyzing production at the factory. The striking workers of Seung Yeun Technology Industries Corp. (SYTIC) set up their picketline just before the 6:00 a.m first shift. They are demanding the reinstatement of 20 workers fired for union activities, respect for the right to unionize, and redress of violations of labor standards on wages, overtime and health and safety. “Two mediation hearings called by the Department of Labor and Employment (DOLE) proved fruitless as SYTIC stubbornly refused to reinstate illegally terminated workers. Thus we have no recourse but to go on strike to win our demands,” explained Frederick Bayot, president of the labor union Seung Yeun Technology Industries Corp. Workers Association. Members of the partylist group Partido Manggagawa (PM) is holding a solidarity rally for the SYTIC strikers starting at 8:00 a.m. today at the main gate of the Cavite EPZA, the country’s biggest export zone. PM is calling on EPZA workers to support the fight of SYTIC workers as their plight mirrors the concerns of the estimated 60,000 people employed in the ecozone. In the last mediation hearing, management informed the workers that the company will shutdown on May 4. Since the mass retrenchment, SYTIC workers have been conducting protest actions. Last Friday, SYTIC workers and their supporters marched inside the Cavite ecozone to highlight their demands. The union was formed in an effort to address numerous workplace issues. 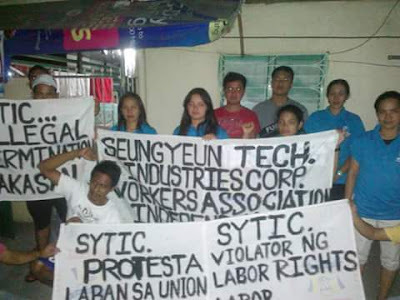 SYTIC workers complained that part of their wages are not paid in cash but in the form of meals, illegal deduction on wages for company events, non-payment of overtime due to an illegal compressed workweek schedule, and the lack of a company nurse, doctor and hospital bed, as provided for in the Labor Code. “Unfortunately no action has been taken by the DOLE since the infractions were reported by SYTIC workers,” argued Dennis Sequena, a PM leader in Cavite and staunch supporter of the SYTIC union. “All the usual ploys in the union busting bag of tricks were thrown at the SYTIC workers. The stick of intimidation and harassment together with the carrot of separation pay were employed against the SYTIC union. But the workers stood their ground to fight for their rights,” averred Sequena. SYTIC manufactures plastic products that provide protection to integrated circuits and electronic components from physical and electrostatic discharge during storage and shipping. It supplies to local subsidiaries of big US electronics companies like ON Semiconductor, a Motorola spinoff, Texas Instruments and Analog Devices.